Laser intended to be used on Mars can spot adulterated honey. 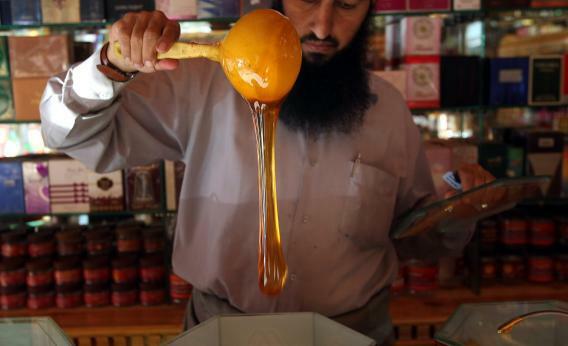 How can you tell whether your honey is legit? Scientists in England have found they can identify counterfeit honey using a laser originally built to explore the universe. It’s sort of like how playing Words With Friends on a smartphone with more processing power than the computers that put a man on the moon. Sometimes these adapted technology stories make it seem like scientists are just standing around shooting lasers at things all day (or injecting weird stuff into toads), but the reality is a little more measured. The European Space Agency has a little thing called the Technology Transfer Programme designed to prove to European citizens that space research is, in fact, worthwhile. (See, Bill Nye, it’s not just us.) Last month, the TTP gave the world better racing tires, thanks to a high-damping material originally designed to protect sensitive instruments in space and about half a dozen other things. This month, they went for the honey. There have been all sorts of scandals regarding the quality of our honey. About 76 percent of what you buy in the grocery store has had its pollen removed. Now, there’s really no good reason for someone to do that—it doesn’t change the flavor or quality, and the ultrafiltration required to do such a thing means extra production costs. Which means the honey was likely filtered for nefarious purposes. Pollen is the only way to track where honey comes from, and certain countries (ahem, China) have reason to obscure its origins because they normally have to pay high import tariffs because their honey is full of heavy metals and antibiotics. Unfortunately, scientists don’t get many opportunities to go play in the Martian atmosphere, so the laser’s mostly been hanging out in the back alley breaking bottles and incinerating cigarettes. Happily, the ESA noticed this and decided to fund a TTP project in order to get themselves, and the laser, some R-E-S-P-E-C-T.
By training the appropriated isotope ratio-meter on the carbon dioxide emitted from burning a bit of honey, Weidmann and company are able to use isotopic fingerprints to compare samples from all over and determine their origins. The same process works for other foods, too, which means better regulation could be coming to the chocolate and olive oil industries as well. Let this be a lesson to all would-be food counterfeiters. We built a laser for Mars, but instead, we’re aiming it at you.